In its first iteration, Google's Android Wear software for computerized wristwatches isn't so much about innovation as it is an effort at simplification. Available in two smartwatches out within the next week, Android Wear is rather limited in what it can do. Even last year's smartwatches do some things that Android Wear can't. But the new software should help rein in a marketplace of confusion and encourage app developers to extend smartwatch functionality, the way they have made smartphones even smarter. In previous watches, each manufacturer modified Android in a different way, so software developers have had to spend a lot of time customizing their apps. It's typically not worth the bother because no single watch has enough users. To confound the problem, Samsung's second-generation smartwatch, out in April, doesn't use Android at all, but rather a fledging system called Tizen. With Android Wear, software developers won't have to rewrite apps every time a new watch from Samsung, Sony or another manufacturer comes out. And collectively, there might be enough smartwatch users to lure developers. In fact, developers should have an easier time with Android Wear than Android phones. Phone manufacturers had customized Android so much that apps sometimes didn't work. Android on phones felt like dozens of different operating systems. With smartwatches, manufacturers will pretty much take the software Google gives them and limit customization to hardware, choices of watch face and apps that come pre-installed. I'll have more to say on the first two watches, Samsung's $199 Gear Live and LG's $229 G Watch, in a separate review later. I used both to test Android Wear, and this review is about that. 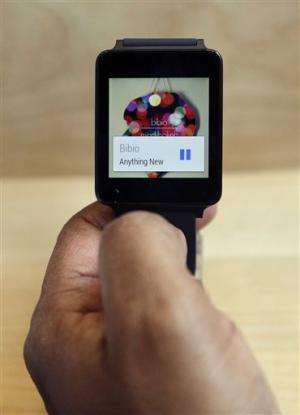 Android Wear requires a companion smartphone running Android 4.3 or later. That covers Kit Kat and the later versions of Jelly Bean, but according to Google's own stats, only about a quarter of Android devices have either. For a variety of reasons, many recent phones can't be upgraded. And of course, no iPhones. The companion phone doesn't have to be from the same manufacturer as the watch. With both watches, I was able to use Motorola's Moto G phone from November, Samsung's Galaxy S III phone from 2012 and LG's G3, which is coming to the U.S. this summer. After getting or updating some free apps on your phone, you need to link the watch and the phone wirelessly using Bluetooth. Most of your interactions with the watch are by voice, similar to using Google Now on Android phones and Siri on iPhones. You can scroll through a short menu of functions, but it's primarily there as suggestions and isn't comprehensive. To activate the voice function, just tap on the watch face or say "OK, Google." You can ask the watch to set an alarm, check your calendar or send a reminder. You can't use the watch as a speakerphone for calls, the way previous Samsung smartwatches allowed. But you can make calls or answer ones that come in. The call still goes through the phone, but that's not a problem if you have a Bluetooth headset. You can send texts by dictating a message or using canned ones such as "Yes," ''No," or "On my way." You can't add your own prewritten response, the way you can on Samsung's previous watches. Android Wear also lets you send and receive emails and read Facebook notifications. I sent myself a draft of this story and was able to read all of it on the watch. If you prefer using the phone, there's a button you can tap to have the message automatically open there. 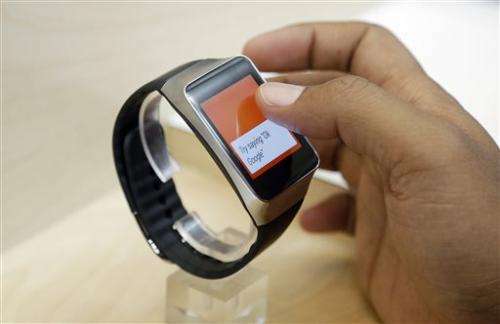 The watches can also keep track of your daily steps, and Samsung's has a heart rate monitor. These tasks and the clock functions are about all you can do without the phone nearby. Where Android Wear advances smartwatch technology is in navigation. As long as the phone is nearby, you can get turn-by-turn directions on the watch. While walking down the street, you can look at your wrist and avoid having to constantly pull the phone out of your pocket. Sony's SmartWatch 2 has a maps app, but it doesn't work as well as Google's. Beyond that, the watch offers the types of notifications you'd get through Google Now on the phone, if you've turned that feature on. That includes local weather, birthday reminders and scores for your favorite sports teams. While jogging to work Tuesday morning, Android Wear even offered nearby bus stops in case I wanted to cheat. Of course, I can simply pull out my phone for all that. Android Wear is supposed to make your life better by displaying relevant information on your wrist, rather than in your pocket. But you still need the phone nearby, and the voice recognition feature doesn't always hear me correctly. Android Wear isn't quite there yet as a must-have product, but I can only imagine what it will evolve into in the months and years ahead. It helps that there's now a unified system that software developers can focus on improving.